Today I have a nail polish I bought last week at Boots. If you're unfamiliar with this brand, Nº7 is the more upmarket brand made by Boots. I don't usually buy much from Nº7 because I think their make-up (especially their nail polish) is overpriced for an own brand. 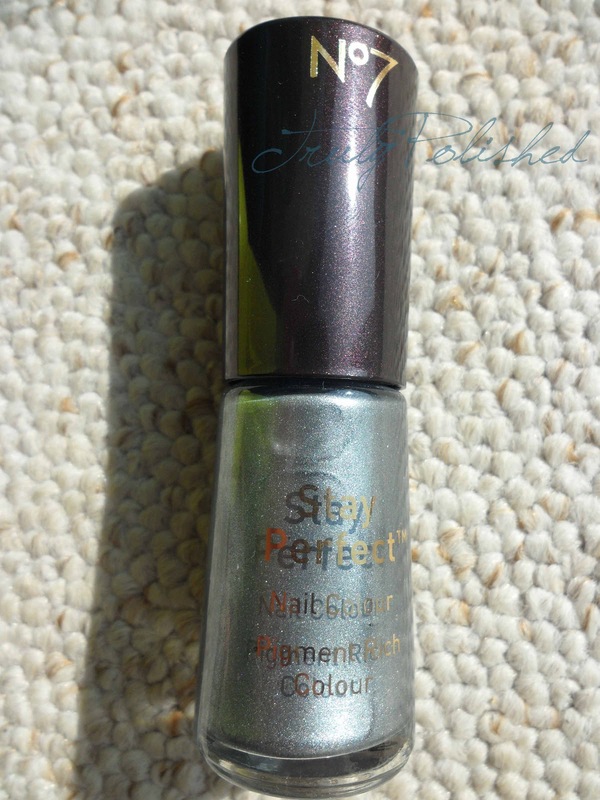 Their Stay Perfect nail polishes retail at £7, but every now and again Boots do deal where if you spend over £5 in store, they'll give you a £5 off Nº7. This is when I normally buy these nail polishes, although I have a tendency to lose them! 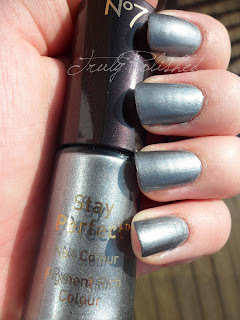 In fact, I only have this one and another (soon to be swatched) as well as the Stay Perfect Fast Dry top coat, the others have all been misplaced! Disco Nights is a blue leaning silver metallic polish. I loved how this looked in the bottle, the blue-ish silver is gorgeous and you can see the tiny metallic particles. I expected this is be super shiny and metallic, almost foil-like. Instead I was disappointed. The polish looks really flat and one-dimensional. It isn't shiny at all, even with a coat of SV it still looks dull. The colour is a lot greyer on the nail and reminds me of the cheap rings I used to wear when I was a child. When the metal got worn, it would turn this grey colour. On the plus side, like the GOSH polish yesterday, this is a one coater as well. It dries really quickly with Seche Vite, and is really pigmented and opaque. For that reason, I'll definitely be reaching for this again, probably with some sort of top coat to jazz it up a bit, or I can use it with my Konad stamps. I have a feeling it would stamp really well! One thing worth mentioning is that within 3 hours of having this on, two nails chipped at the edge! I wrapped my tips too, so I really don't think this is a "wear solo" polish at all. All the photos below have one coat of Disco Nights topped with one coat of Seche Vite. 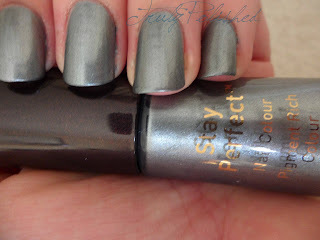 You can find this polish online here Nº7 Stay Perfect Nail Colour where it retails for £7. Alternatively, have a look in your local Boots store!